In its Award dated 7 July 2014, the Permanent Court unanimously decided that it has jurisdiction to identify the land boundary terminus and to delimit the territorial sea, the exclusive economic zone, and the continental shelf between the Parties within and beyond two hundred nautical miles in the areas where the claims of the Parties overlap. The Tribunal was also unanimous in identifying the location of the land boundary terminus between Bangladesh and India and in determining the course of the maritime boundary in the territorial sea. 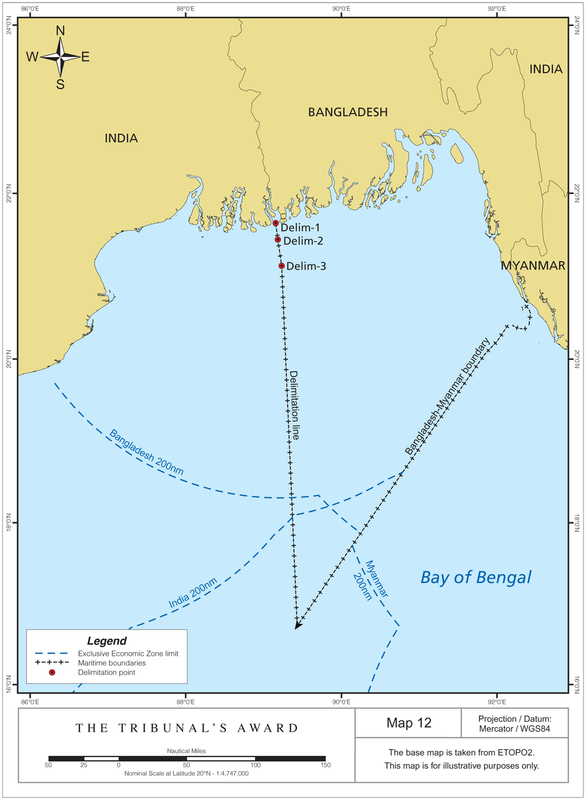 By a majority of four votes to one, the Tribunal determined the course of the maritime boundary line between Bangladesh and India in the exclusive economic zone and the continental shelf within and beyond 200 nautical miles (press release). You can read the full Award from the PCA here as well as the separate concurring and dissenting opinion to the Award of judge Pemmaraju Sreenivasa Rao.